A publicity photo of Joe Louis, 1934. Photo credit: MARBL African American Photograph Collection, Emory University. 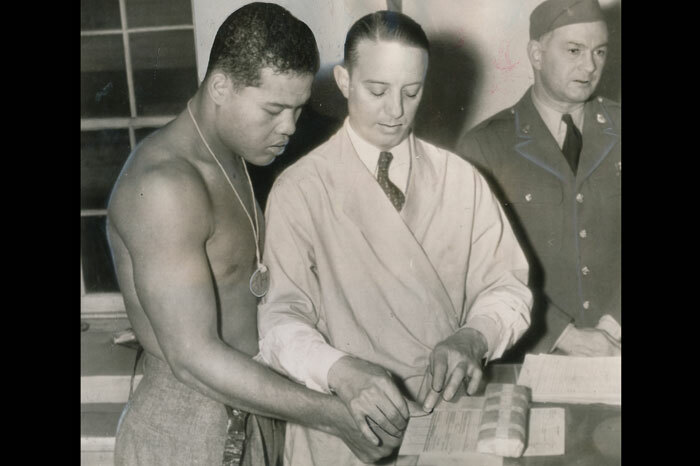 Joe Louis Barrow being fingerprinted when he enlisted in the US Army in January 1942. Photo credit: Pellom McDaniels III collection. 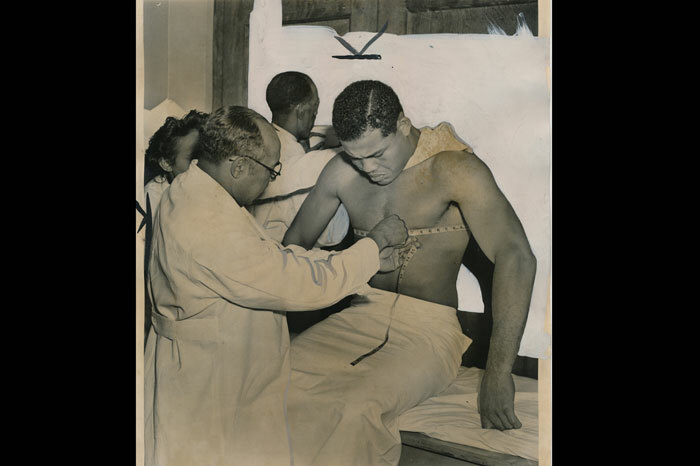 Joe Louis Barrow getting a physical examination when he enlisted in the US Army in January 1942. Photo credit: Pellom McDaniels III collection. Joe Louis Barrow in his US Army uniform. Photo credit: Pellom McDaniels III collection. 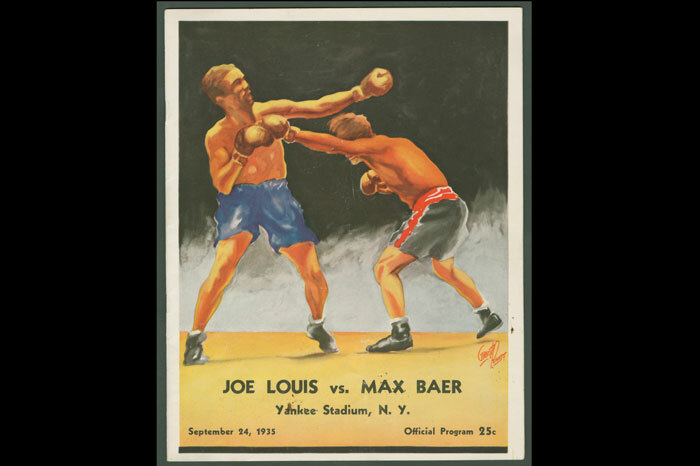 A fight program from the Joe Louis/Max Baer matchup at Yankee Stadium in 1935. Photo credit: MARBL African Americans in Sports Collection, Emory University. The life and legacy of boxing great Joe Louis will be told through a traveling exhibit based on photographs, periodicals and archival materials from Emory University’s Manuscript, Archives, and Rare Book Library (MARBL), with his son, Joe Louis Barrow Jr., scheduled to speak at an opening event Nov. 13. 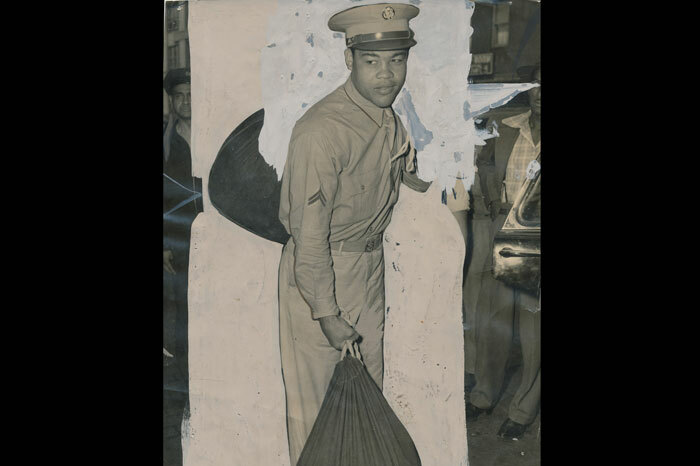 "Joe Louis Barrow: A Life and Career in Context" will feature large panels with text and images of Louis, highlighting his childhood, his family's move to Detroit, his decision to turn professional, his key fights, and his years in the Army. The event, which is free and open to the public, will take place from 6 to 8 p.m. Wednesday, Nov. 13 in the Jones Room on level 3 of Emory's Robert W. Woodruff Library. The opening will include photos, fight programs and other materials drawn from MARBL collections, as well as film clips of Louis' significant boxing matches such as the 1935 fight against Max Baer, his 1936 and 1938 bouts with Max Schmeling, and his 1946 match against Billy Conn. The exhibit and its opening are part of this year's Race and Sports in American Culture Series (RASACS), a roster of events examining the intersection of race and sports throughout American history. The series was developed by Pellom McDaniels III, faculty curator of MARBL's African American Collections and assistant professor of African American Studies, and Dana White, senior faculty curator and professor emeritus of American Studies, in collaboration with various entities across the Emory campus. McDaniels and White created the traveling exhibit to bring awareness of MARBL's collecting focus on African Americans in sports to different communities. They also hope to engage audiences that might not otherwise think of Emory as an accessible source for such materials. 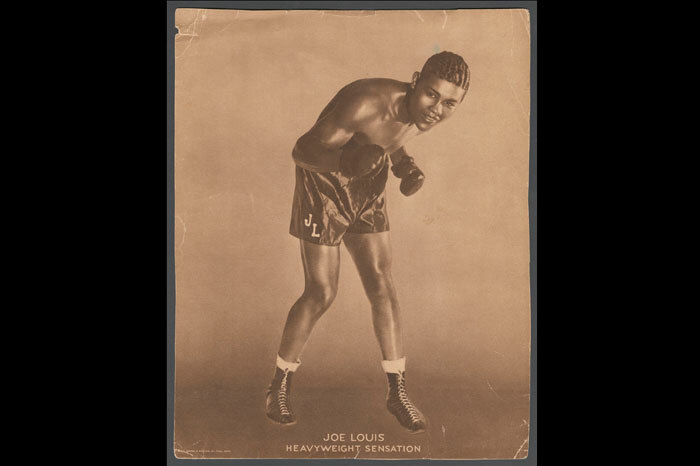 MARBL's materials on Joe Louis come from several collections, including books on Louis from the Billops-Hatch collection, photos from the Langmuir African American photograph collection, fight programs from the overall African American collection, and broadsides from films in which Louis appeared as a boxer from the African American cinema collection. As Louis' 100th birthday nears (May 13, 2014), the exhibit will travel this spring to his birthplace of Chambers County, Ala., his hometown of Detroit, and the cities that hosted his key bouts, Chicago and New York, before returning to Emory. Between its opening in November and its spring travel schedule, the exhibit will be displayed on level 2 of the Woodruff Library. 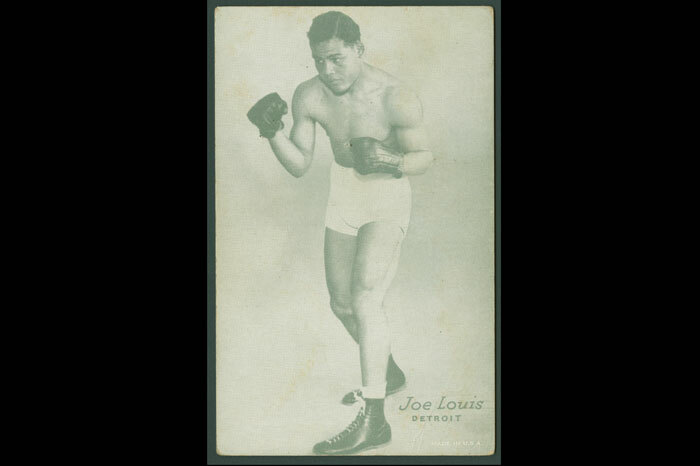 Joe Louis Barrow, who boxed under the name Joe Louis, is considered by many to be the first well-known African American athlete. He was born the seventh of eight children to sharecropper parents, themselves the children of slaves. When he was about 12, his family moved to Detroit, part of the Great Migration of African Americans from the rural South to urban life in the Northeast, Midwest and West. Louis became interested in boxing while hanging out at a youth recreation center in Detroit. He made his professional debut in 1934 in Chicago, and held the title of world heavyweight champion from 1937-1949, earning the nickname "The Brown Bomber." He retired in 1949, hanging up his gloves for good in 1951 with a record of 68-3. He was much admired for his clean image and gentle demeanor outside the ring during his career, but his retirement years were rocky. He died in 1981 at the age of 66. McDaniels says he has found that many people have unfortunately forgotten who Louis was or don't know about him—where he came from, what his life was like, or how his success impacted America and the rest of the world. "Thinking in terms of the unintentional consequences of the First World War, the Great Migration and the interwar years, Louis' appeal to the black masses was significant because most shared similar roots—growing up in the South, sharecropping, migrating to a northern city, finding opportunity and taking advantage of it," McDaniels says. "With his burgeoning success in the face of adversity, Louis became a Messiah type that converted the dreams of success for millions into reality in the boxing ring."